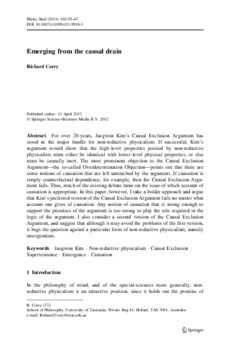 For over 20 years, Jaegwon Kim’s Causal Exclusion Argument has stood as the major hurdle for non-reductive physicalism. If successful, Kim’s argument would show that the high-level properties posited by non-reductive physicalists must either be identical with lower-level physical properties, or else must be causally inert. The most prominent objection to the Causal Exclusion Argument—the so-called Overdetermination Objection—points out that there are some notions of causation that are left untouched by the argument. If causation is simply counterfactual dependence, for example, then the Causal Exclusion Argu- ment fails. Thus, much of the existing debate turns on the issue of which account of causation is appropriate. In this paper, however, I take a bolder approach and argue that Kim’s preferred version of the Causal Exclusion Argument fails no matter what account one gives of causation. Any notion of causation that is strong enough to support the premises of the argument is too strong to play the role required in the logic of the argument. I also consider a second version of the Causal Exclusion Argument, and suggest that although it may avoid the problems of the first version, it begs the question against a particular form of non-reductive physicalism, namely emergentism.